Add 1 to 2 tablespoons of vegetable oil to a medium pot set over medium-low heat. Add the chicken and brown on all sides. Coarsely chop the whole white onion and mince the garlic cloves. Divide the onion and garlic in halves. 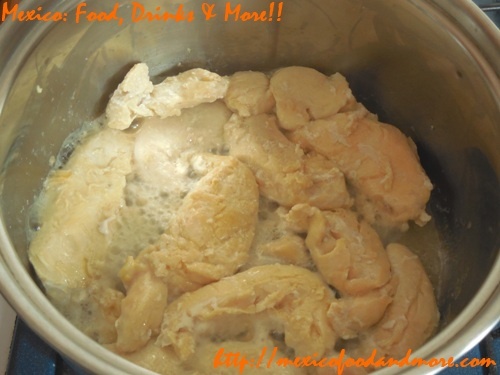 Add one half of the onion and garlic to the pot with the chicken and add water to cover the chicken. 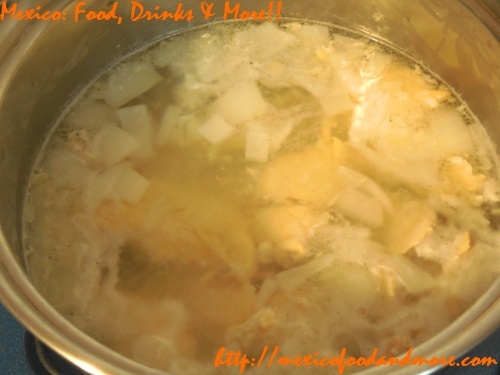 Bring to a boil, then reduce heat to low and simmer until done, about 15 minutes. Drain and allow the chicken and onion to cool. Shred the chicken. While simmering the chicken in the steps above, add the remaining half of the chopped onion and minced garlic to a medium saucepan along with the peeled and cubed potatoes. Cover with water, set over high heat, and bring to a boil. 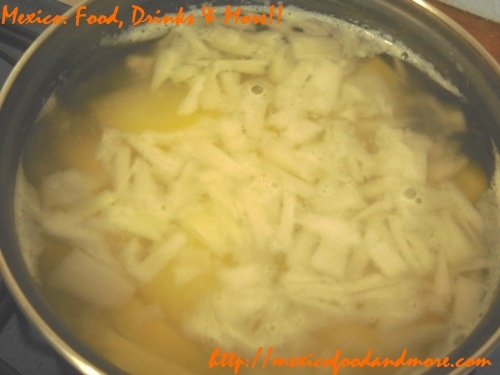 Reduce heat to low and simmer until the potatoes are tender, about 20 minutes. 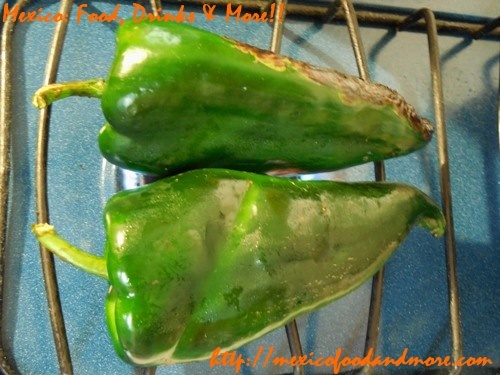 While the potatoes are cooking, set the poblano peppers over a low flame on the stovetop, on a comal (griddle) set over low heat, or under the broiler in the oven. Roast the peppers until the skin blisters and is blackened on all sides. Then place the roasted peppers in a plastic bag, close it, and allow them to steam about 5 minutes. 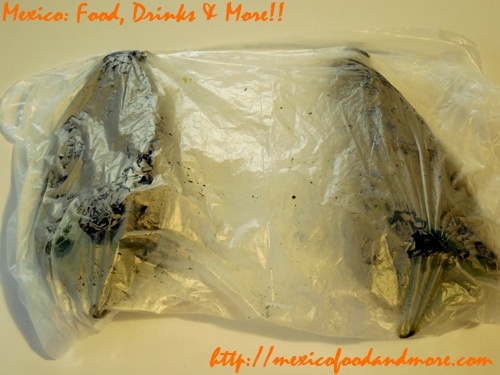 Remove one poblano from the bag at a time. 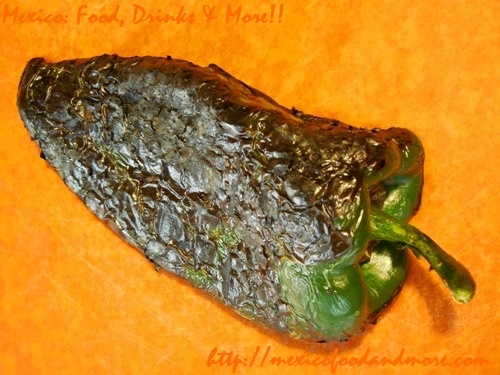 Using a butter knife, lightly scrape the blackened skin off the pepper. 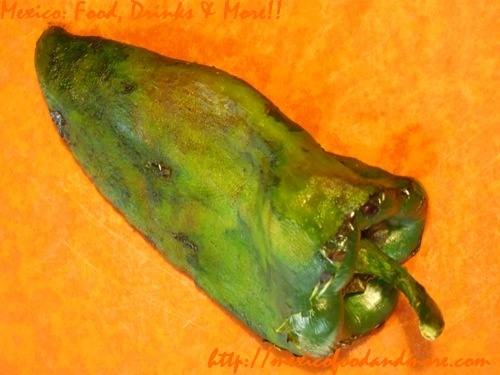 Scrape the skin off of the other pepper. Remove the stems and seeds. 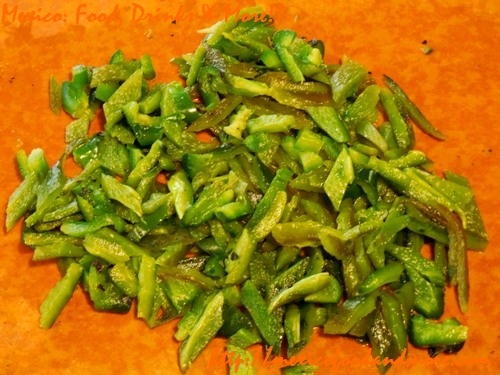 Thinly slice the poblanos into small pieces (“rajas”) and set aside. Once the potatoes are tender, drain the water, but be sure that about 1/3 cup hot water remains with the potatoes. 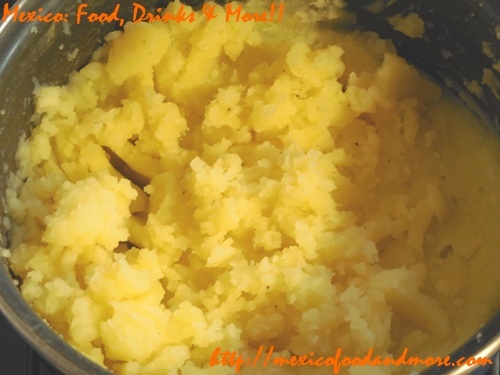 Mash the potatoes until smooth and season with freshly ground black pepper and salt to taste. 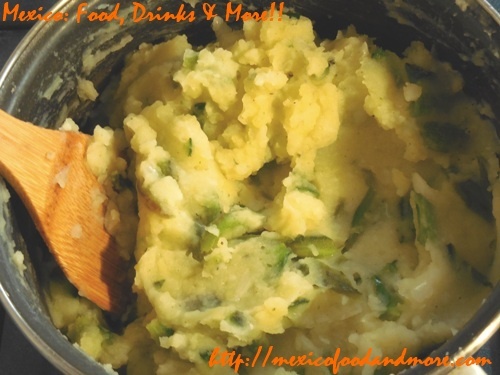 Add the poblano rajas to the mashed potatoes and stir to combine thoroughly. Add vegetable oil to a large frying pan set over medium heat until the oil is about 1/4-inch deep. 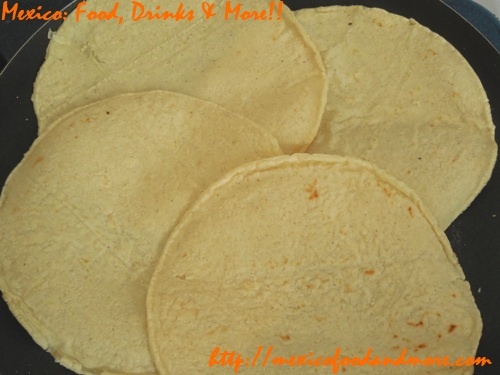 While the oil is getting hot, heat up 4 corn tortillas on a comal (griddle) set over low heat (so they won’t tear when you roll them up after adding the filling). 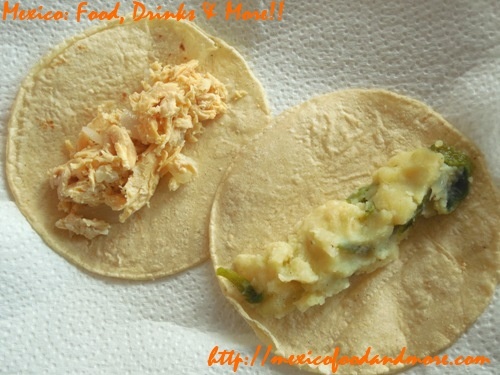 Add chicken and onion to one warm tortilla and add potatoes with rajas to the other. 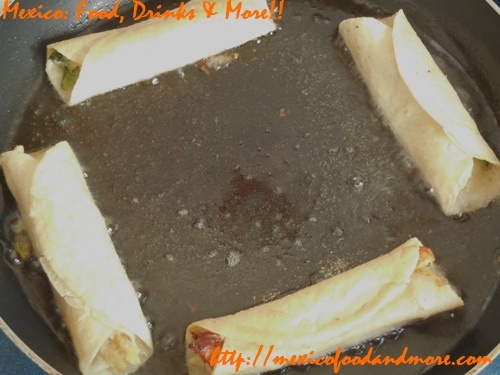 Roll the tortillas up and place seam-side-down in the hot oil. Repeat with the other two warm tortillas. 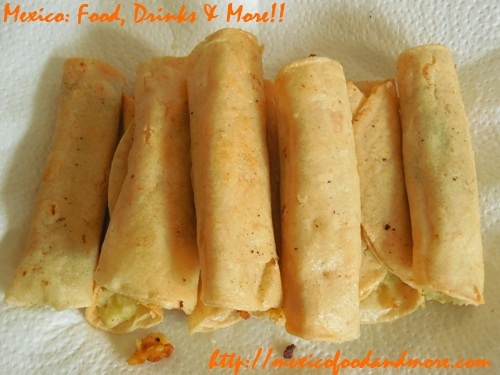 Fry the tacos, flipping occasionally, until they’re golden brown and crispy on all sides. Repeat the above steps until you’ve used up all the chicken and potato filling or you’ve made the number of tacos desired. Save any remaining filling so you can make tacos another time. Place 3 to 5 crispy tacos on a plate. Drizzle a little sour cream over them. Top with shredded lettuce, sliced onion, a little more sour cream, avocado salsa, crumbled queso fresco, and sliced avocado. Serve immediately. 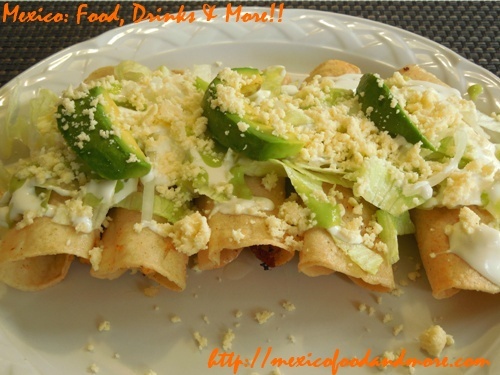 In Central Mexico, tacos dorados are commonly served as a side dish to pozole. 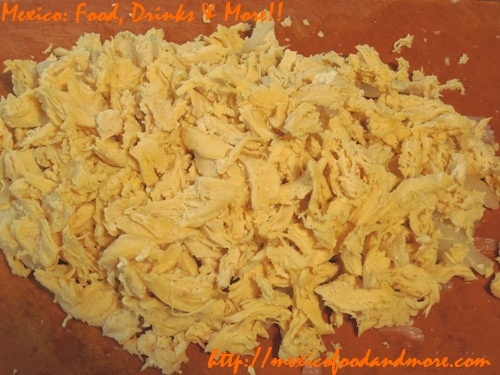 This entry is filed under Appetizers, Chicken, Dinner, Meat Recipes, Side Dishes, Traditional Dishes. You can follow any responses to this entry through the RSS 2.0 feed. You can leave a response, or trackback from your own site.